For the past two weeks I've been getting the question "So, are you going back to Germany over Christmas?" and I'll say "Yes," and then the person will say "It's going to be really cold, huh?" On an average, fifteen of the sixteen or seventeen hours you are awake on any given day are usually spent INSIDE. Being inside in San Francisco during winter means that the average 56 F / 13 C degrees outside during the day, and 41 F / 5 C at night translate into no more than a max of 60 F / 16 C degrees inside, assuming you live in a typical Victorian/Edwardian building. 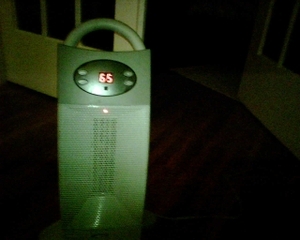 If you try really hard and turn up the heat, you might be lucky and get 65 F / 18 C ... you add a space heater on top of it (if you can bear the humming sound and the 'blowing warm air' sensation) you might even reach 70 F / 21 C for a short amount of time. Switch the whole thing off and you'll be back to 60 F within 15 minutes. So, when I'm leaving for Germany on Friday I'll make sure to pack enough short-sleeved T-Shirts, because even though it might be freezing outside (maybe around 20 F / -6 C at night, and 32 F / 0 C during the day), we'll have almost tropical heat inside the well insulated brick walls: with only minimal energy it stays at 75 F / 24 C ... yeayyy !!! You are so right, Dani. It's freezing outside here too but I'm sitting around inside in a tank top and shorts! I love free heating! Hope you have a super vacation, a very Merry Christmas and a kickass New Year. Can't wait to see all the pics..